Caitlin Doughty does for us what Jessica Mitford did in 1963 with The American Way of Death. Doughty writes a beautiful and thought-provoking memoir, reminding us that, as Americans, we do not acknowledge or respect death as a reality of life. She discusses how we've allowed our grieving and death rituals to become cold and commercialized. An honest look into the modern death industry and how we don't - but really should - understand it. Did you ever read the first line of a book to see if it grabbed you? Well, this odd memoir grabbed me from the first sentence and wouldn't let go until the end of the source notes. Most of us probably hold at least a little bit of morbid curiosity about what goes on behind the doors at your local crematorium. 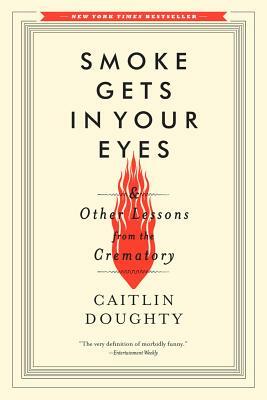 Your curiosity will be more than satisfied by Ms. Doughty's account of her years as a burgeoning mortician. In addition to details such as how they keep those darn eyelids closed during the funeral, Doughty educates us on death rituals from around the world and obscure funeral laws. There was a day when the families of the dead were responsible for preparing the bodies for burial, but -- with the advent of the funeral business -- our society has become detached from the reality of death, to the point of denial. Doughty seeks to reconnect us with the very last page of the last chapter in our book of life.